I like to roam about with multiple WiFi-capable devices, and since I don’t subscribe to built-in internet services for any of them, I looked into getting a personal mobile WiFi hotspot. I wound up getting a neat product called Karma. The Karma is small device about the size and shape of a beverage coaster. It has a single multi-function button and several lights that show the current connection strength and power level. It can operate untethered for about 6 hours, and you can charge the battery by plugging the device into a powered USB port. 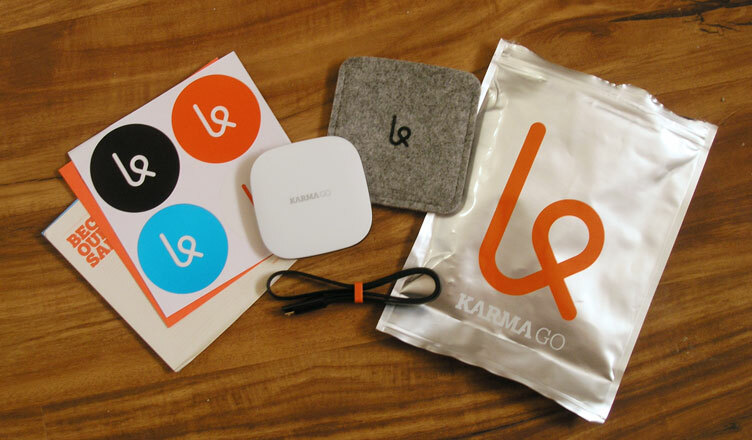 I recently upgraded my original Karma to the new Karma Go, an LTE version with expanded coverage and improved speed. It can also sit in standby mode for up to 220 hours. The above pic shows what came in the package. Karma offers two data plans: the pay-as-you-go Refuel plan (what I use) and the monthy-subscription Pulse plan. Refuel costs $59 for 5GB and $99 for 10GB. The data never expires, and from time to time, Karma WiFi offers ‘double data’ sales, which is a great time to stock up. If you decide to go with the Pulse option, it costs $40 a month, which is pretty good if you need to be connected to it all the time. Once you’ve set up your account, using the Karma is easy: just press the power button, wait a few seconds, connect the hotspot with your device, and you’re online. What makes this device especially unique is the ‘karma factor’. Karma gives you the option to share you’re WiFi with up to eight people, who can be random strangers at the airport, the park, or on the beach. When people sign into your Karma WiFi, not only do you get a warm fuzzy feeling from helping others, you also get awarded 100MB of data for each new log-in. If too many connections start affecting you’re own bandwidth, I guess you can kick people off using the Karma app. That would be rude of course and, fortunately, I’ve never had to do that. I know some readers may be thinking, why not just pair the mobile devices to a smartphone? We’ll, I’m not really a ‘phone guy’. I currently use a $20 pay-as-you go flip-phone that has about 1200 minutes on it, and I tend to carry over at least 1000 minutes every year. I talk to very few people on the phone and very briefly at that. I mainly keep it with me for emergency use, so paying a regular monthly phone bill just doesn’t make sense for me. Like I said, I’m not a ‘phone guy’. But WiFi access is not optional for me. I do a lot of research when I’m writing and drawing, and I do a lot of of my writing and drawing when I’m away from home. Most of the time, I can rely on a free local WiFi access at work, the public library, or the local diner, but when I’m at a location that has poor or no WiFi access at all the Karma comes to the rescue. Recently, I wanted to use my Karma at my daughter’s Brazilian Jiu Jitsu class. I wasn’t getting any connection where I was sitting so went to the front of the studio and placed my Karma on top of a soda machine. When I went back to where I was sitting, it was all good. I love having this kind of flexibility with the device. It makes a nicer beverage coaster too.